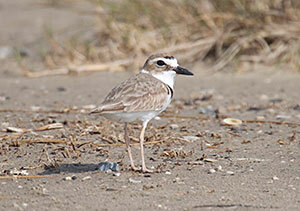 Texas beaches provide habitat for an impressive assortment of birds. Wintering Piping Plovers, migrating Red Knots, and breeding Least Terns take advantage of the productive Gulf marshes and beaches. The Deepwater Horizon Oil Spill brought these and many other near-coast species into sharp focus and reminded us how little we know about their populations and ecology. To address this data deficiency, several organizations partnered to develop a year-round shorebird survey to provide useful data for Texas scientists, land managers, and conservationists. The protocol is designed to optimize compatibility with other Gulf shorebird surveys as well as the Audubon Coastal Bird Survey and the International Shorebird Survey. There is far too little time and energy for redundancy. 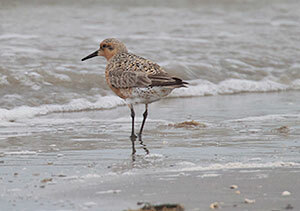 Note that this survey was formerly called the Texas Shorebird Survey. The survey started this past spring with primary counters in place. We welcome additional help. If you’d like to take your birding skills to the next level, come join our growing team! For more information, contact Richard Gibbons at rgibbons@houstonaudubon.org or Erik Johnson at ejohnson@audubon.org. The project partners believe the strength of the survey is the ease with which data are entered, archived, and publicly available. All data are entered through the eBird Texas portal using all the features available in eBird and three additional data fields specific to the project: human disturbance, amount of trash, and amount of wrack. A similar effort, the Florida Shorebird Alliance, is ten years in the making. It is accomplishing many of these goals and provides an excellent model. There is great hope that our project will likewise succeed given the solid group of partner organizations involved. The Audubon Coastal Bird Survey is a Gulf-wide network of volunteers and stakeholders. Erik Johnson has compiled several excellent resources for surveyors on the Audubon website. The International Shorebird Survey is a volunteer-based monitoring network that provides hemispheric data on shorebird populations. ISS was launched in 1974 by Manomet's Brian Harrington. Brian coordinated hundreds of teams of dedicated volunteers conducting field surveys during spring and fall migrations and analyzed the data to discern important trends and migration phenology for shorebird populations.